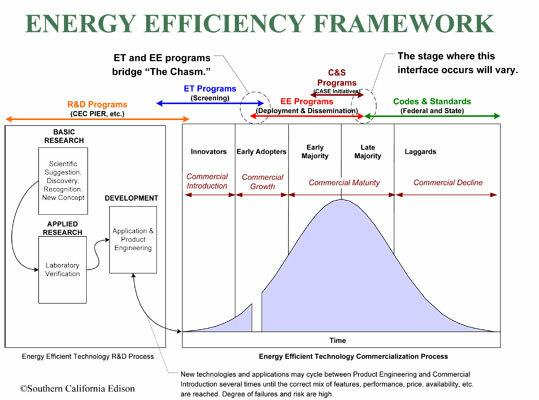 The Emerging Technologies Coordinating Council (ETCC) coordinates the efforts of member utilities to access and market cutting edge, energy efficient technologies. ETCC members include: Pacific Gas and Electric Company (PG&E), San Diego Gas and Electric (SDG&E), Southern California Gas Company (SCGC), Southern California Edison (SCE), Sacramento Municipal Utility District (SMUD), and California Energy Commission (CEC). The ETCC is supported and advised by the California’s Public Utilities Commission (CPUC). Please visit our website for more information about the ETCC or download the Strategic Plan PDF for more information about the Strategic Plan. Fundamental to the ETCC is the CEC’s PIER Program, Public Interest Energy Research and Development. PIER funded research, public and private, provides early development of emerging technologies, which are validated at utility customer sites and marketed in utility programs and coordinated within the ETCC. The primary purpose of the ET Summit is to give visibility to PIER and private supported researchers and innovators of energy efficient cutting edge technologies to utilities, government officials and citizens. Convincing laboratory results foster customer site validations within the ETCC, leading to market transformations. The ET Summit will also provide Keynote Speakers and four Technical Tracks of expert speakers addressing scientific, technical and financial information, Residential/Mass Market, Commercial, Industrial/Agricultural/Financial and Energy Policy and Planning. RDL enterprises is the event planner for the ET Summit. Please feel free to contact us by phone or email with any questions and we'll see you at the 2010 ET Summit.